If you have paid attention to the knitting scene for a while, you might have realized that knitted mesh or net turns up every once in a while in a design. That could be interpreted as knitters being fashion forward – it is apparently a trend right now (see pic) or one could think that knitters really do not care and do/knit whatever they feel like. 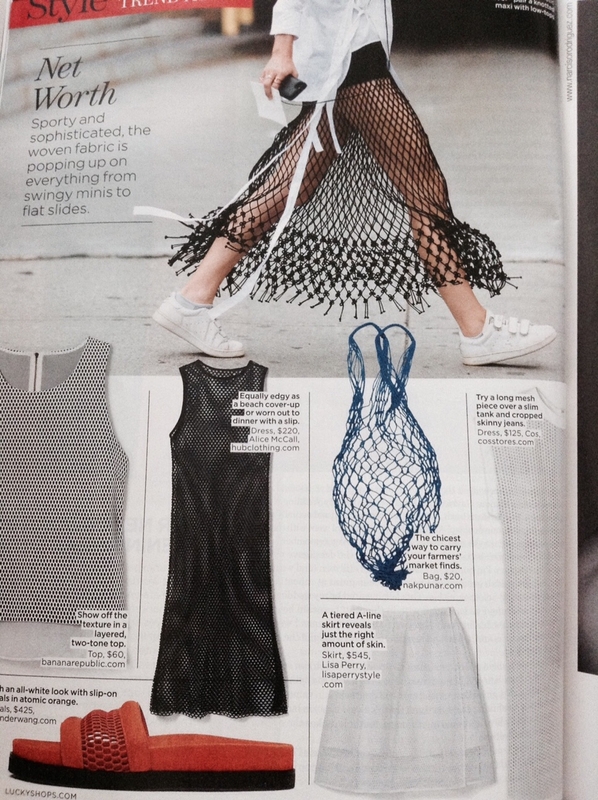 What it definitely shows is that you cannot go wrong with knitting some mesh, especially this Spring/Summer season. To help you out I have been searching ravelry.com for suitable projects and have found quite a few that I think would carry you over the warm season nicely. Angelina Cardigan – picture from here. This cardi is a one size fits all – it is oversized and makes for a great ‘throw-on-and-go’ piece in warmer temperatures. There is a wide variety of yarns you could use, Cascade Ultra Pima and Butterfly Cotton for the utilitarian look, if you are going for something special why not use Habu Tsumugi Silk double stranded, or Habu Wrapped Silk? For the kniters who want mesh but a bit more structure, here is a more traditional short sleeved cardi. The original pattern uses a worsted weight yarn, however a slightly lighter yarn works well also. Rowan Creative Linen is definitely an option, as well as Rowan Pure Linen, there is also Drops Bomull-Lin. I would go all out with the yarn on this one. It is originally knit in a DK weight yarn, but I am seeing Shibui Twig, Quince Sparriow, Habu Wrapped Merino, and Habu Tsumugi Silk with an added strand of Silk Stainless to give it body. Again, this makes for a versatile piece of clothing for summer, dress it up or down. We have added Berroco Captiva to our range of summer yarns this year and I have found a design for you that fits into the trend of mesh. Void by Norah Gaughan. Picture from here. I have concentrated my search on garments, however if you feel rather like knitting an accessory, there are plenty to be found on ravelry also. Just enter ‘mesh’ or ‘net’ as keyword into your pattern search and you’ll find a large variety of designs. I kinda like the first picture But I’m not a fan of the square shape. Mesh reminds me of the 80s though! Your posts are the absolute best! !